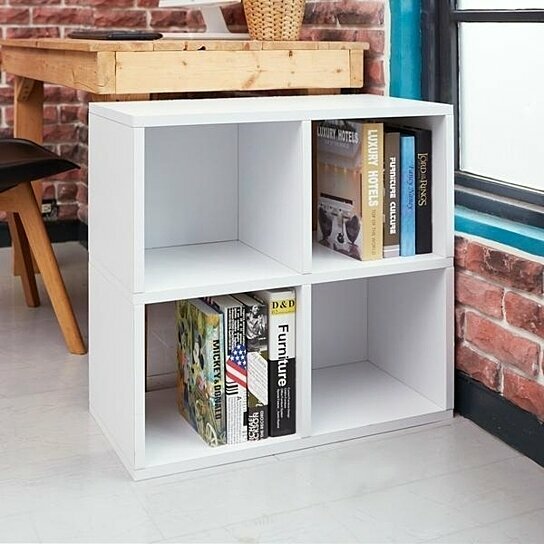 The natural white Quad Cubby Organizer is the result of you, our customers! After many requests for a design that featured multiple cubes, we came up with the quad cube. Strong enough to hold 50 pounds, the Quad Cubby Organizer is spacious and durable. Way Basics makes it easy to assemble too, no tools are needed to put these modules together. All you do is peel the 3M adhesive, stick them together and you're done! All products are made from sustainable paperboard that we call zBoard. It is non-toxic, VOC and formaldehyde free. Designed to be safe for your home and family. Exterior Dimensions D: 12" | W: 26.4" | H: 24.8"
Interior Dimensions D: 11.2" | W: 11.8" | H: 11.2"